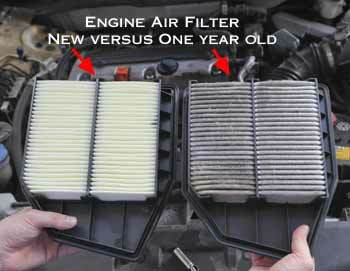 Home > Car Care > How often should an engine air filter be changed? The air that enters your engine flows through the air filter. The filter catches sand and other debris protecting your engine and helping it last longer. The engine air filter should be replaced between 15,000 and 30,000 miles, depending on driving conditions. If you drive on unpaved roads, it needs to be changed more often. 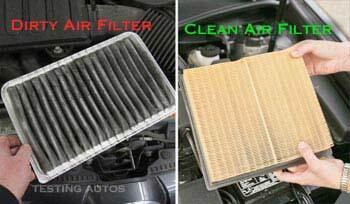 If you don't drive a lot, an air filter should be replaced at least every 3 years, as with age it becomes brittle. An old filter can tear, allowing dirt and sand to enter the engine. An air filter is installed inside the air filter box. It's made of pleated paper-like material. The air flows from the bottom up, so dirt and larger objects are trapped in the box under the filter. As you drive, the air filter becomes dirty. As the air filter clogs up, it restricts the air flow into the engine. This adds strain on your engine, making it harder for it to "breathe." Due to increased vacuum, some dirt particles could be sucked through the filter and scratch the engine pistons and cylinder walls. For the same reason, the engine may start consuming more oil. Symptoms of a dirty air filter include lack of power on hard acceleration and at higher RPMs, although it's not always noticeable. Clean vs. dirty air filter. The fuel economy may also be affected, although not by much. In extreme cases, the "Check Engine" warning light may illuminate on the dash. An air filter is inspected during your regular oil changes. Your mechanic can check its condition and let you know if it needs to be replaced. 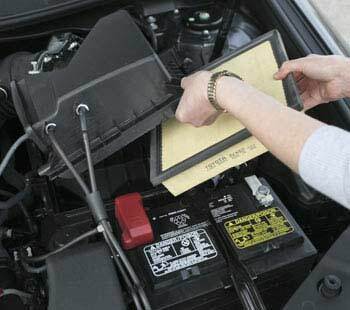 Many mechanics test the condition of the air filter by looking at the light source through the filter. If no light is visible through the filter, it must be replaced. The filter on the right is dirty after 24,000 miles. For example, compare these two air filters in the photo. 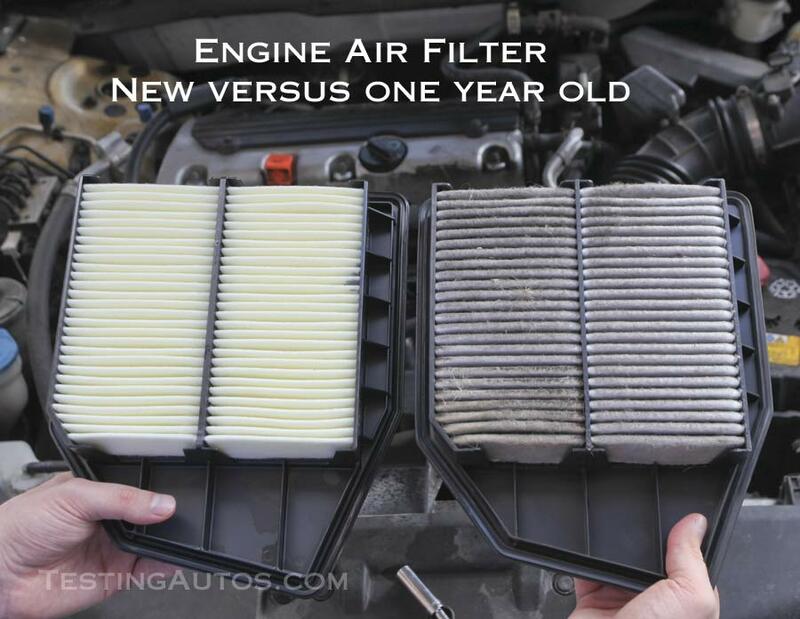 The filter on the right has been changed one year ago, but the owner of this Honda drives over 24,000 miles a year. Now it looks dirty, so the owner decided to replace it again. If you want to check it yourself, your vehicle's owner's manual has the engine compartment map. In some cars, to open an air filter box you will need some tools, like an 8 mm or 10 mm socket or a screwdriver. In other cars, the air filter box cover is held by a few clips. In most cars, it's a very simple job. If you change your air filter yourself, be sure it fits properly and the air box is closed tight after. If the air filter box is not closed properly, the Check Engine light may come on. Replacing the air filter in the repair shop is not very expensive: $10-$30 labor plus $19-$45 part. Is it important to have an air filter replaced at a dealer or can a fast lube shop do the job? Replacing an air filter is fairly easy in most cars and can be done in any garage, however using a factory (OEM) part from a dealer will ensure that it fits properly. If you decide to opt for an aftermarket part, invest a little extra for a premium brand for better engine protection. Is it necessary to replace a cabin (pollen) filter whenever an engine air filter is replaced? It's not necessary, however if the engine air filter is dirty, the cabin filter is likely to be in the same condition. Timing Belt: when should it be replaced?